The Bull Run Trail Association is a volunteer organization that maintains the trail surface and signage and deals with disturbances on the Bull Run Trail. 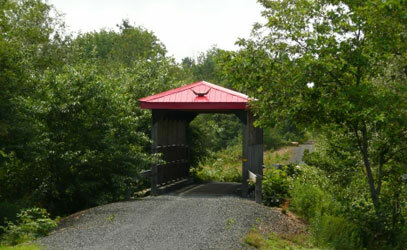 This 23 km long rail-trail boasts one of the only covered trail bridges in Nova Scotia. Lots of scenic picture opportunities there! The trail connects a number of communities including Bridgewater, Wileville, Hebbville, Hebb’s Cross, Italy Cross and Middlewood. It travels by a number of local subdivisions as well as along farmers fields, lakes, marshes and woodlands. This provides a great opportunity to stop and enjoy some lovely scenery with benches and picnic table provided along the route. Click here for more information on the Bull Run Trail. Meetings We met the last Tuesday of each month at the Days Inn in Bridgewater.